Close collaboration among coalition forces, the Iraqi government and international partners have helped to transform Iraqi security forces and partner forces in Syria in the fight against the Islamic State of Iraq and Syria, Operation Inherent Resolve's director of partner force development said today. Canadian Brig. 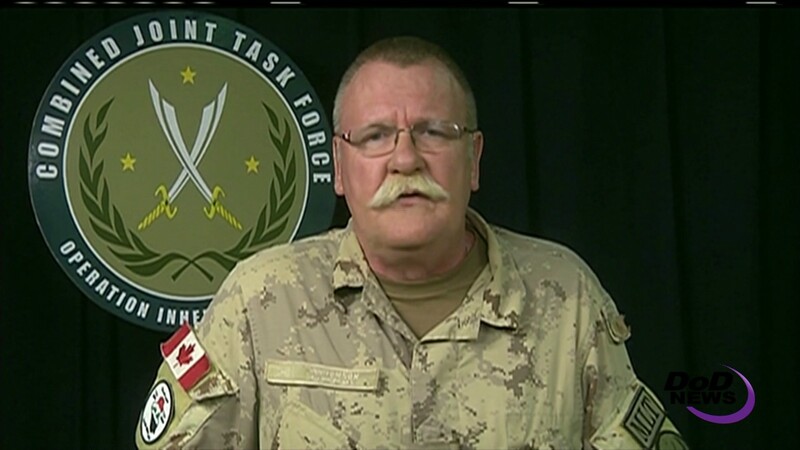 Gen. David J. Anderson, who also directs the Canadian-led ministerial liaison team, briefed Pentagon reporters by video conference from Baghdad. The general is responsible for staff oversight of the train-and-equip enterprise for the coalition's partner forces. Anderson provided an overview of operations in Mosul in Iraq and Raqqa in Syria, a review of assistance to partner forces and a look at the efforts of the ministerial liaison team. In Raqqa, the Syrian Democratic Forces just finished the first month of offensive operations to defeat ISIS in the terrorist army's self-declared capital, taking about 17 square miles of ground from ISIS in and around the city. "On Monday night, the SDF gained a foothold into the old city of Raqqa by breaching the ancient al-Rafiqa wall, and they are now progressively pushing further into the city," the general said. "The SDF are exerting pressure on ISIS from four different fronts throughout the city with a push to the east along the southern portion of the Euphrates River. ISIS is now completely encircled by SDF forces"." The fight in Iraq is going well, the general said, but tough days lie ahead. Still, he added, "I'm confident that our partner forces are up to the task." In Mosul, the Iraqi security forces have pushed into the final 500-meter pocket of ISIS-held ground in the Old City. They're within sight of the Tigris River from the west "and are facing an enemy on its absolutely last legs," Anderson added, noting that the imminent liberation of Mosul "rids Iraq of ISIS and sets conditions for political reconciliation." The coalition's role in preparing for what comes after ISIS is to train and equip forces to hold territory and wide-area security forces so stabilization can occur, Anderson said. The coalition's partner forces have liberated nearly 2 million Iraqis from control ISIS and taken back more than 70 percent of ISIS-held terrain. "In the face of determined resistance, they have they have placed relentless pressure on Daesh," the general said, using the local name for ISIS. Coalition support of partner forces takes the form of advice and assistance and kinetic elements such as strikes and intelligence, surveillance and reconnaissance, Anderson said, along with training and equipment. Since its inception, he added, the coalition has trained 106,000 members of the Iraqi security forces, including 40,000 Iraqi soldiers, 15,000 police, 6,000 border guards, 21,000 peshmerga fighters, 14,000 counterterrorism service forces and 9,500 tribal mobilization forces. This year alone, the coalition has delivered weapons, about 900 Humvees and more than 1,300 support vehicles for 75,000 Iraqi troops and police. "In Syria, we have trained over 8,500 members of the SDF, and just this year have delivered weapons and ammunition and over 400 vehicles and personal equipment for over 40,000 troops," Anderson said. "This support is the essence of the 'by, with and through' strategy, enabling our partner forces to defeat ISIS," the general said. "These forces have liberated more than 4 million civilians throughout Iraq and Syria. They have fought and sacrificed dearly, and I honor their martyrs and, more importantly, I'm confident that they will win this fight." 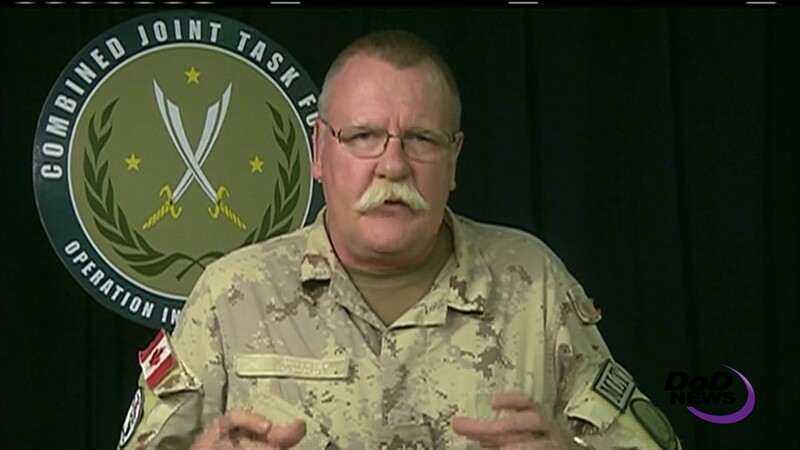 The Canadian-led ministerial liaison team advises, assists and acts as a liaison to enable the campaign plan and set conditions for an enduring and sustainable Iraqi security force, Anderson explained. Specifically, he said, "we work with the ministries of interior, defense, peshmerga and health and for the national security advisor in the prime minister's National Operation Center." The team of 13 members from eight countries is a true coalition effort, Anderson added. Earlier this week, the team delivered the first of 100 "police presence in a box" packages, which the general said are temporary stations that give a local police force the equipment needed to establish themselves in areas where ISIS has destroyed the infrastructure. "The equipment for this project arrives in a shipping container and includes a tent with a large working space, furniture, lighting, water tanks, laptops, phones, GPS, weapons storage, checkpoint equipment and two Land Cruisers -- in essence, everything they need to set up a visible presence," Anderson said, noting that the contents can be unpacked and set up quickly to allow the police to immediately begin serving their citizens. Delivery of the first of the 100 containers will roll out over the summer and will be followed by a "border guard in a box" project that will give Iraq's border service a similar capability, he said. "An effective and credible police and civil defense structure is imperative in order to make the transition from the current green, or Army, policing to true blue policing based on the model of intelligence-led community-based policing, which is the future," the general added.